If you thought the Fatal Frame series was terrifying, wait until you hold it in the palm of your hand. You'll get your chance on April 13, when Nintendo releases the augmented reality-powered Spirit Camera: The Cursed Memoir for the Nintendo 3DS. Spirit Camera takes all the creepiness of Tecmo Koei's terrifying horror series and projects it onto the real world using augmented reality. Players must help a young girl named Maya break free of a curse placed on her by the mysterious Woman in Black. 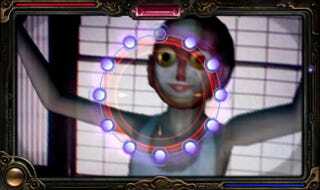 The game's story mode utilizes a 16-page augmented reality book called the Diary of Faces, drawing the player deeper into the tale. Yep, probably going to pee myself several times over with this one. On the plus side it's a portable game, so I can drop my 3DS in fright as well, effectively killing the game and anything associated with it. I like that kind of power. Look for Spirit Camera: The Cursed Memoir to hit stores on April 13. Friday, April 13 that is. Muhahahahaha.